The weather in Discovery Bay, California has been overcast with a smell of rain and temperatures in the 60’s. Fine Scottish weather. Occasionally, it has rained. Not necessarily hard but if you are outside you get wet. Although we can always use the rain and hopefully snow in the mountains, the nerve of it to rain on my golf days. Are you a Fair Weather golfer or do you play the game as it was intended- all conditions? Golf- this ancient Scottish game has always been played in all conditions. Obviously, safety must be taken into consideration, therefore play is halted for lightening. In the old days, even in the early 20th century, golf was played in the rain and there was no rain gear. Today, we are very modern and light, waterproof material exists. Thereby, we now have rain gear. Tops and pants to put over our existing clothing and essentially keep the golfer dry. Do you own rain gear? Do you play in the rain? If you are playing and it begins to rain, do you keep playing or immediately quit? If there is light rain, will you tee off and start a round? Do you say that there are enough nice days that you don’t play in the rain? I’m curious how most amateur golfers feel. I tend to play on my regular days even if there is light rain or wind. Sometimes we play but don’t keep score. We hit a second ball if we hit a bad shot and just call it a practice round. The point is, I love golf, as you should be able to tell from this website. Those hours on the golf course to me are relaxing and to be honest the only exercise I really get. I am looking into an exercise program that I can do at home and not spend tons of hours at but in general, golf is my thing. The other day, it was somewhat rainy, overcast and one could say dreary. 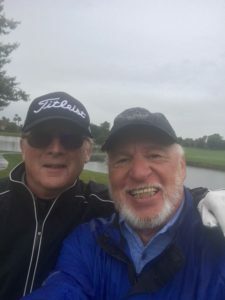 It was one of my regular golf days and my friend George and I said we would meet at the course and then decide about playing. Unless it was downright pouring, that is. My other normal partners did not play. One because of the weather and the other was out of town. George and I spoke on the phone and agreed to meet at the course. I always keep my rain pants in my golf bag. Rain Pants are great to keep your rear-end dry as the golf cart seat gets wet. A wet rear-end is no fun. We actually met in the parking lot and agreed the rain wasn’t heavy enough to stop us from golfing. We both had on our rain tops and put on our rain pants. I’ve had rain gear for many years now but several years ago I asked my wife for better rain gear, for Christmas I think. I wear the jacket more than I use the pants and even took the jacket to Ireland (didn’t bring clubs, it wasn’t a golf trip) and wore it when I didn’t need a heavier jacket. Quite often my attire is a golf shirt and a V-neck sweater and then I wore my rain jacket. I played golf twice in Ireland and rented clubs. My rain jacket was perfect for the weather. It is also very good in the wind. Back to golf the other day. We got a cart and teed off on the first hole. At the second tee we caught up with the foursome in front of us. We knew the golfers and they said play through, which we did. I was driving the ball well. George was over gripping because of the rain and was hooking his drives. We decided to play this as a practice round and therefore hit a second shot if the first one was really bad. On the fourth hole I hit a good drive to the island fairway and decided to hit a hybrid to get over the water for my second shot. I sculled my first ball, dropped another and sculled it again. Both shots were so bad they didn’t even reach the water. I hit my third shot but still double bogeyed the hole. At least I didn’t lose a ball. We then played the fifth hole and I bogeyed it. At the sixth tee box I told George I wanted to take a selfie to send to my brothers-in-law and a friend back east. We then teed off and I pared the hole. We continued to play the front nine in light rain and sometimes just a mist. Starting the back nine it wasn’t really raining. George got control of his over-gripping and began to drive the ball better. Oh well, I was no longer out driving him. My buddies are for the most part longer than me and so I’m used to being the short guy in the back, although every so often I catch one. The lack of rain didn’t last and it began again, albeit light. However, being out there you will still get wet from the accumulation of drops. We caught up to The Friday Groups by hole 14 and then had to wait. They had 3 foursomes. I kidded with my friend Lowell on the 14th tee box. We then waited our turn and continued play. When we finished 16, there was a group on the green at 17 (a par 3) and a group waiting on the tee. George had a time restraint so we decided to quit and have lunch at the club. As usual we had a good time playing golf together and with our raingear we stayed dry. I spoke with some of the Friday Group players in the parking lot after the round. Unlike us, they played serious golf. The weather didn’t stop them. I’m far from a professional golfer and not an expert but I have learned a few things about playing in less than ideal conditions. So here goes my opinions. Keep your clubs dry with a club umbrella, a bag rain cover or a cart overhang. Keep your hands and grips dry. I hope you’ve enjoyed this blog. I had fun playing and fun writing about it. How do you feel about playing in less than ideal conditions? Do you agree with my tips on playing in inclement weather? I would love your feedback. Please leave your comments in the section below.